I told you I would get back to the food! 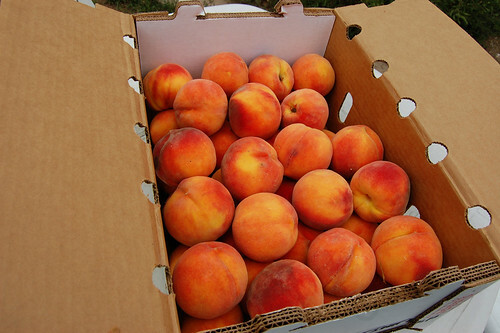 Two weeks ago we went to the Golden Farmers Market for the SOLE PURPOSE of buying a box of peaches. It's usually best for me to go the the farmers' market with a purpose because I've found that otherwise I just wander around with a goofy smile on my face basking in the local beauty. Then I forget to buy anything and just leave which makes me cranky the rest of the week. So: Purpose: Peaches. 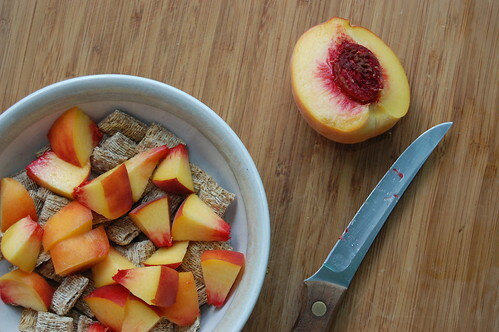 Peaches are hands down my favorite fruit. I wouldn't say that they're my favorite food (I wouldn't want to risk things like baklava or rum cake hearing me and getting their feelings hurt), but they win by a mile in the fruit category. 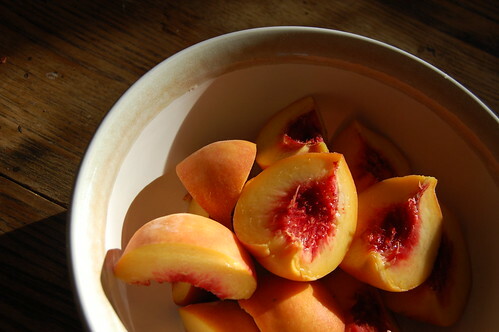 I wait all summer to eat a perfectly ripe peach; and the farmers' market is just the place to find what I'm looking for. I don't care if the dude on the King Sooper's commercial says "the same peaches I take to the farmers' markets are the ones I take to King Sooper," because that just can't be true. Those grocery store peaches are crap compared to these. At first, I bought these with the purpose of making peach freezer jam. I actually wanted to buy a box of over-ripes because they're cheaper but when my favorite stand didn't have any I didn't have the heart to go home empty handed. As soon as I bit into one of these lovelies all thoughts of jam were swept from my mind. Juice dribbled down my chin and my eyes welled up with tears. These peaches were not born to be chopped up and frozen. So I started eating them fresh. Then Z-cakes decided to start eating them so I had to eat them FASTER (because I'm still not that great at sharing). 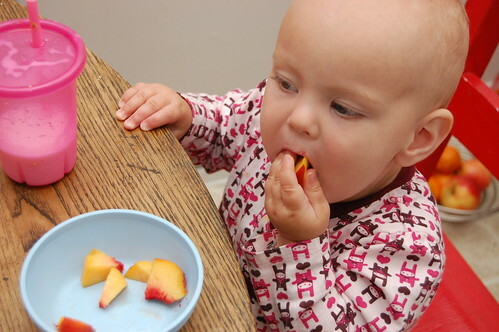 I remember that for a brief period of time I thought that I liked nectarines better than peaches. I realize now that the reason for such craziness was that I was living in Bellingham, WA and didn't have access to a decent Utah or Colorado peach. I was probably buying sub-par peaches from the grocery store and always being disappointed. I suppose if I ever move back to Washington I'll have to just find a decent supplier (mom) that can ship Utah/Colorado peaches direct. Maybe I can make a trade for apples. Of course if you know me at all, you know I used these peaches in numerous dessert recipes right? Sadly, very few pictures of said desserts were taken. They were usually made late at night...quickly devoured...and not that pretty. For example: I'm trying to roll out pie dough at 9:30 PM and it is cracking ALL OVER THE PLACE. And it appears as though it is NEVER going to be big enough to fit the entire pie plate. So, I finally just slap the thing into my pie tin and begin my par bake. I yell to N8tr0n that there will be no cute crimped edge on the pie tonight and shockingly, he doesn't care. Coming from a long line of pie bakers I have absolutely no recollection of ever eating pie that didn't have a beautifully crimped crust. thinking back... yeah I'm pretty sure that's never happened. Grandma (mother's middle name here) may be making that exasperated sigh at me right now. Even without the cute crust...Ooooh they were good. And that was all that mattered. :: this cobbler recipe that Rachel sent me is fantastic and easy. :: finally, this recipe by Hil was devoured by all at our Labor Day BBQ. It was delicious. And I'm eating another piece of it right now. As I said...it isn't going to win any prizes at the fair. Martha would be disappointed because it certainly isn't TV worthy. But since I like to take inspiration from Julia instead of Martha, I will "make no apologies." 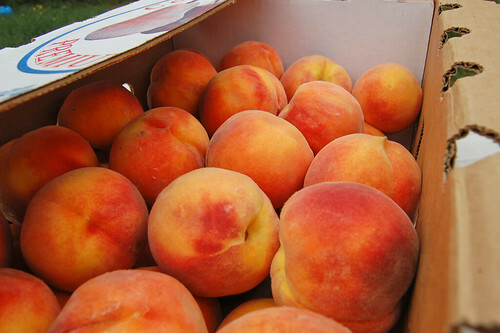 Look for me again this Saturday at the farmers' market buying another box of peaches. Maybe this time I'll actually buy those over-ripes. *An unauthorized picture of this pie can be found here. I don't know that I've ever had a peach from Utah or Colorado. And I love peaches. THANKS FOR TELLING ME THAT I LOVE CRAP. (Insert envious salivating) Oh, man, I would kill for a box of peaches. 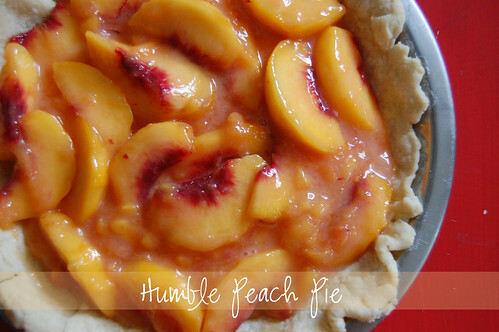 I love peaches on waffles and ice cream and pie crust and in any way possible. If that's all I had to eat this week, I would be fine. All your desserts look sooo good. I might have to snag a ride to a farmers market this weekend to pick up some of my own. Mmmmm. Yum. Yum. YUM! I want them now.